Loren Ami is a traditional Hopi-Tewa potter. 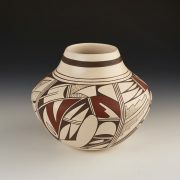 He's the grandson of Sadie Adams and Eleanor Ami and learned to make pottery by working with Dextra Quotskuyva Nampeyo. He's been an active potter since 1990. Loren has perfected the craft of making canteens, probably one of the most difficult pottery forms to make. 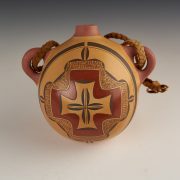 In this old-style Hopi canteen, Loren has used the motif of the four cardinal directions and the four direction of the sacred winds. To illustrate some of the difficulty in making canteens, Loren first coils and smoothes two matching hemispheres, whose edges must be identical. 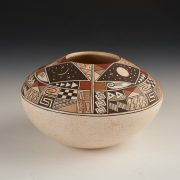 Then he fuses the two hemispheres together with a watery mix of the clay. He then hand polishes the surfaces and applies the design. 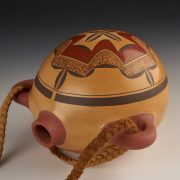 (Loren's designs use only traditional mineral and vegetal paints.) If the fusing of the two hemispheres is not done perfectly, the spheres break apart during the firing, and he must start all over again.